SWE's POW-R TOTE is a portable, rechargeable lithium-ion power system ready to use anywhere, anytime standard power sources are not available. High Capacity: 117/99Ah; Versatile: 12V vehicle plug and Anderson SB50 Powerclaw are standard. Custom connectors configured-to-order. Lightweight: Only 23lbs; Compact: Size of a lunchbox, 11.8" x 9.8" x 7.7"; Heavy duty: water tight storm case. High capacity and compact-convenient energy for military, emergency management, law enforcement, fire/rescue and many other remote field operations. Power systems innovator Southwest Electronic Energy (SWE), has expanded their POW-R TOTE® line to include a variety of Solar Charger options. 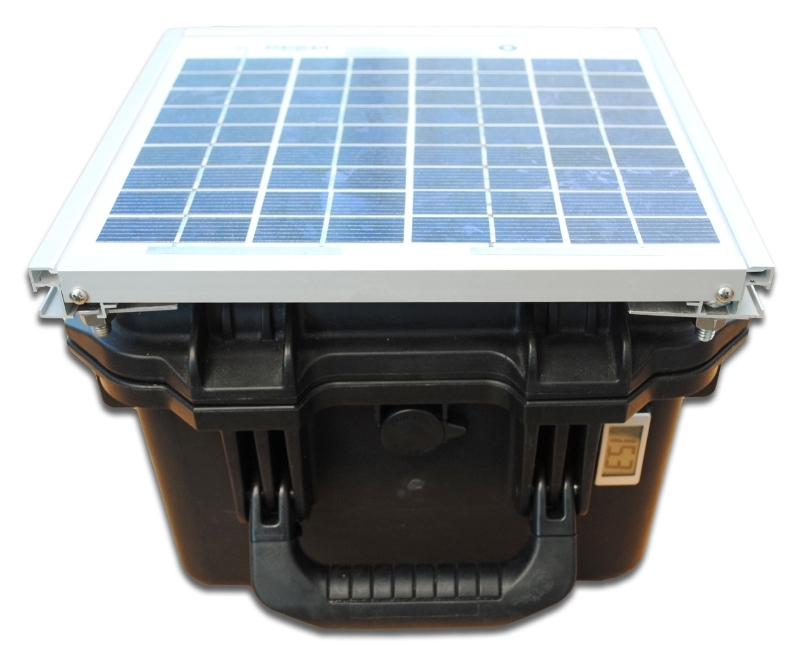 In addition to the AC plug-in DC Charger, POW-R TOTE can be outfitted with a 5W-124W Solar Charger thus enabling the unit to be fully remote for indefinite periods of time. 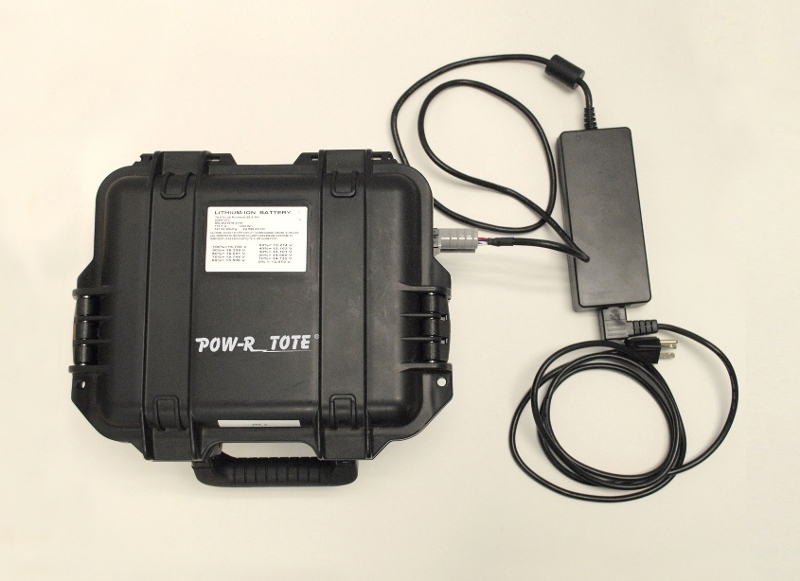 In addition, POW-R TOTE is now available in both 99Ah and 117Ah capacities allowing the user two options based on their power requirements. POW-R TOTE, originally employed by U.S. Marshals for quiet & efficient electrical energy, is available to military, emergency managers, marine, law enforcement agencies fire/rescue operations and many more field applications. About the size of a lunchbox, and weighing only 23lbs, POW-R TOTE uses reliable, powerful lithium-ion battery technology to deliver 2X longer run time and 2X more power at 1/2 the weight when compared to a typical 12V lead acid battery commonly used in similar applications. SWE POW-R TOTE with attached 5W Solar Panel. Maintains charge during use with low power devices in optimum weather conditions. POW-R TOTE® is virtually indestructible in a watertight storm case which can handle harsh environments. Two power connectors come standard: An automobile 12V auxiliary outlet (car plug) powers and recharges cells phones, notebook computers, tablets and other low power devices. An Anderson SB50 Powerclaw® connector is also provided for higher power gear like surveillance, signal generators, lights and power tools. SWE will configure-to-order other connectors and energy capacities to meet customer's unique needs. Recharging POW-R TOTE is easy with an optional external AC plug-in DC charger that plugs into any outlet or a custom or with a Solar charger which is available in increments from 5W to 124W. POW-R TOTE also comes standard with SWE's integrated intelligent battery management system, POW-R BMS®, which regulates the health & safety of the battery. A convenient voltmeter is also built into POW-R TOTE which indicates the power remaining in the battery at all times. Lithium-Ion is the fastest growing type of battery because of its high energy density (weight-to-size ratio). POW-R TOTE lithium-ion delivers 2X longer run time and 2X more power at 1/2 the weight compared to a standard car battery. Reliable, safe, and clean with very low maintenance, lithium-ion is used in a broad spectrum of applications from land and underwater vehicles to personal items such as laptops and cell phones. Since 1964, Southwest Electronic Energy (SWE) has been a pioneer in innovative energy solutions serving the specific needs of original equipment manufacturers. SWE's advanced battery solutions serve a broad industrial customer base including military, emergency management, subsea, oceanographic, oilfield services and pipeline inspection. Located in the greater Houston metropolitan area, our foundation is built on long lasting relationships with a focus on service, quality and reliability. SWE is ISO 9001-2008 certified and proudly serves over 300 customers, many of which have been with SWE throughout the company's 50 years. 0 comments on "SWE's Portable Power System, POW-R TOTE, Now Includes More Charging Options And More Power"